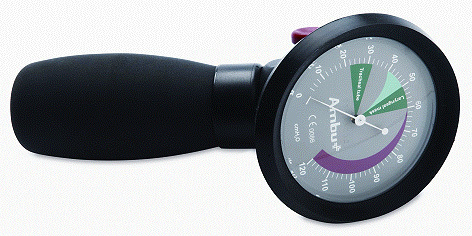 The Ambu® Cuff pressure gauge is designed to inflate and monitor cuff pressure on either laryngeal masks or endotracheal tube. The large easy to read dial has two measurement zones showing the correct inflation for either device.  Can be directly connected via standard luer connection or via included connection tubing.